Bullion prices surpassed the threshold of $1,300/oz. for first time since Donald Trump was elected in November, suggesting the protraction of reforms and global economic uncertainty are too rife for investors to focus on Main Street fixed investments. Kristian Rouz – The price of gold, one of the main international safe-haven assets, surpassed the $1,300 threshold on Friday for the first time since Donald Trump was elected US President in November. The rise in bullion prices reflects increased volatility in the global capital markets, and a lack of certainty over the path of the US economic growth, as the Trump-proposed reforms are lagging. Among the world’s safe-haven assets, which include the US Treasury notes, the Japanese yen, and Deutsche Bunds, gold and bitcoins, the bullion enjoys a privileged position at this moment. The US Treasuries are a volatile investment ahead of the debt ceiling debate and a possible US government shutdown in October, while other non-physical havens, such as bonds and currencies, are facing exposure to the risks stemming from the US volatility which are too significant to be considered safe enough investments. Gold and bitcoins, both having recently increased in price, are becoming a preferred method to safeguard parts of investment portfolios, especially ahead of the expected profit-taking in the overpriced stock markets. However, the rise of cyber-attacks and cyber-terrorism are rendering investors sceptical of bitcoins and block-chain technologies, preferring to stick to the tried and true avenues. Physical gold has been one of the highest-yielding assets over the past several decades. As evidenced by the pricing dynamics of the Krugerrand, a South African gold coin, it has outperformed local real estate, global stock markets, and the gold price in dollars between 2000 and 2017. An ounce of gold in the Krugerrand cost 27 rand ($35) in 1967, when South Africa first started minting the coins in order to attract investment amidst the growing international left-wing backlash over Apartheid. Currently, 1 oz. of Krugerrand gold costs 16,840 rand ($1,273) – and its appreciation was most stunning between 1995 and 2015, from 2,500 ZAR up to roughly 20,000 ZAR, not least due to the economic turmoil in South Africa in the past 20 years. The example of the economic collapse of South Africa in the post-Apartheid era demonstrates that when things go south, gold gains in value more significantly than other types of assets. 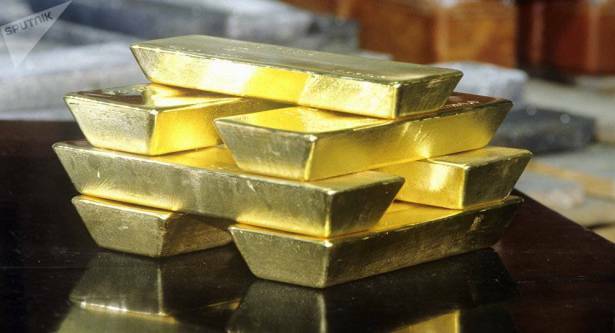 Besides, the falling international gold production, mainly, in Africa, due to the political turmoil and perpetual warfare raging across the continent, has contributed to the rise in gold prices. “Growth in mine output is at its lowest point since the financial crisis, with risks only getting greater,” Daniel Hynes of Australia and New Zealand Banking Group wrote in a note. Another reason is the Trump factor. When Donald Trump was elected in November, the expectations were high the business-friendly President would enact across-the-board reforms that would boost US economic growth. These expectations pushed stock prices higher, and haven assets lost ground for the time being as investors were seeking higher profits in equities. However, as President Trump finds himself mired in Washington partisan politics and obstruction, the enthusiasm has waned, and the capital is flowing back to safety. Besides, lower macroeconomic projections and central bank policies benefitting the virtual assets and fuelling bubble concerns, are driving investors into gold. At this point, gold production is becoming a less and less lucrative business, supporting the gold prices as gold output is projected to further decrease. In order to produce an ounce of gold. An average gold mine would lose $1,083 in input costs, according to the data from PiercePoints. At current prices of $1,300, a 20 percent profit margin is better than in investment banking, for example, where the ultra-low interests are weighing on operational profitability.